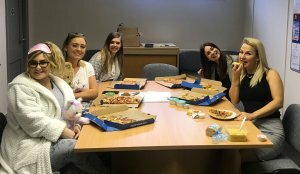 When the World Sleep Day Committee organised an entire day devoted to the importance of sleep, part of the Rapid team sprung into action. The Team celebrated World Sleep Day by getting cosy, and dressing in what they wear to bed, but in the office. All for a good cause, to bring awareness to sleep related issues. The day kicked off with one member of the team getting ‘accidentally’ locked out of the office – we can’t imagine how this happened. Kitted out in full-on pj’s and sleep accessories, she happened to get stuck in the corridor, at the very same time a certain handsome chap from the company opposite walked by. Then In the spirit of celebrating sleep, it was pizza for lunch. If you want to get into bed with the Rapid Team, come and join us at Offshore Wind Connections Annual Conference on 25-26 April at Double Tree by Hilton Hull.